In the Delaware Park Poker Lobby you will see a scrollable list of ring game tables, along with relevant information and statistics for each table. (4). you can choose between No limit / Pot limit and Fixed limit tables. 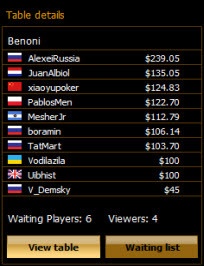 You can sort the list according to your preferences by clicking on any column header (stakes, limit, players, average pot, hands per hour, etc). 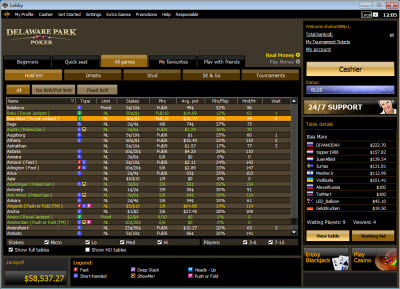 You can also filter the list according to stakes, number of players, and tables' availability using the checkboxes below the main table. Click once on any table to see a preview of who's playing at every table in the Table Information box to the right, including how much money they have and whether anybody else is waiting to join that table. Click on Join Table or Waiting List to get in on the action. You can also double click on any table in the main list to sit in. If a table is full, you will be prompted to join that table's Waiting List, until a seat becomes available. You can buy in to a ring game with the maximum amount of chips, or specify a different amount in the window that pops up. 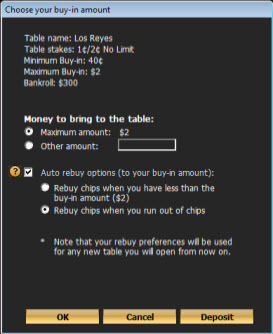 Mark the Automatically get more chips checkbox to automatically buy in again with a new stack of chips if you happen to go bust at the tables. Just select the amount you want to buy in with automatically, and click OK.